One of the most virulent yet paradoxical criticisms that is hurled at Bhagawan Sri Sathya Sai Baba, especially ‘post-Mahasamadhi’, is that He is God for the rich, the influential and the mighty. 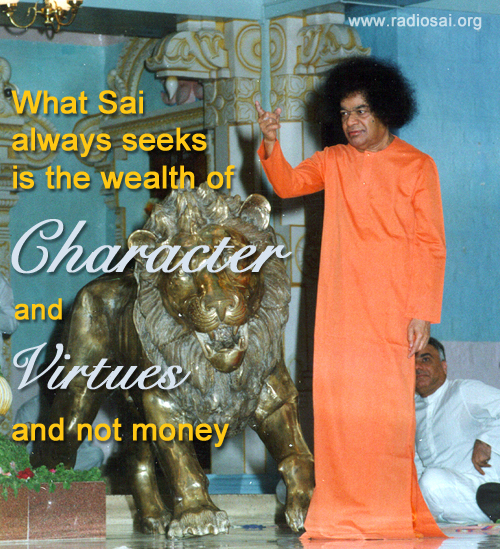 I say virulent because, after Bhagawan’s hospitalisation almost every newspaper, tabloid and magazine in India screamed headlines about the ‘size’ of His trusts, the ‘value’ of assets of the Sri Sathya Sai Organisations worldwide and the money in His name. I also say paradoxical because if at all there is anything that Swami has been ‘allergic’ to, it has to be money. I am sure that any one of us who have heard Swami speaking about money will know that He always speaks along these lines only. But not every one of us has got the chance to ‘see’ this detachment that Baba has towards money specifically and towards everything generally. And the few who got this chance to see His detachment, have it emblazoned in their hearts and minds. Elsie gave Baba letters from American devotees and showed him enlarged photographs of the Christ on the cross which he had manifested for Hislop. Talking business, she asked Baba if she could sell the picture and if so, how much she should charge. He smiled. "No, no, I am not interested in the money; don't talk about money with me. Do your duty—it is your business. Money comes and goes, morality comes and grows." Again, such sayings take on a deeper meaning in Baba's presence. It is apparent that he really means it when he says that he is not interested in money and does not want to talk about it, that it is a source of a great deal of conflict from which He intends to stay entirely free. At the same time, He understands and accepts its significance in the lives of His devotees. This episode stifled that squeal forever. This experience that he narrated to Radio Sai’s Karuna Munshi in a candid interview brought tears to my eyes. For those that are unaware, Mr. Ryuko Hira was born Kamlesh Punjabi, in Jaipur, India. 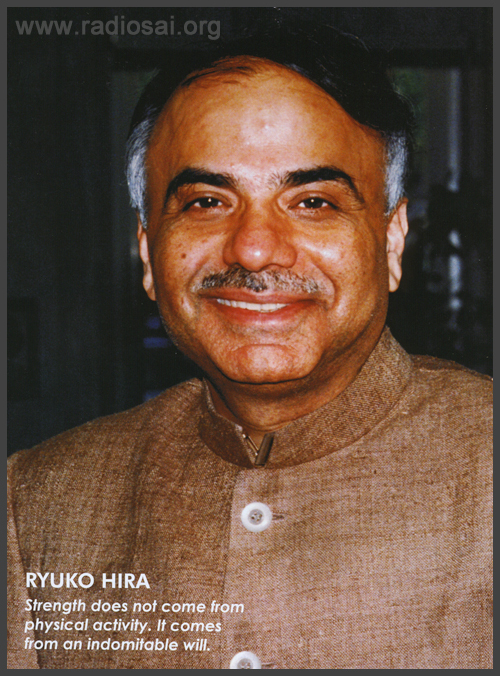 In his professional life, Mr. Hira is the Chairman of the Ora Group of Companies in Japan. Currently, he owns and operates over 50 hotels and resorts in Japan, and provides management and advisory services to 90 hotels. He has been considered as the richest Indian in Japan. But he has a far greater wealth as far as his heart his concerned. Since his heart has been pledged to Sai, what gives him most satisfaction and joy is his association with Sai and the Sai movement. His name is synonymous with the Sai movement in Japan and the South-East Asian region. It was in early 1991 when the construction of the super specialty hospital at Puttaparthi, which Bhagawan Sri Sathya Sai Baba had announced, was in progress. This was a novel ‘experiment’ that Swami had taken up in all confidence and enthusiasm. It would run totally free of cost. It would be a model to show that all one needs is a pure intention and love - the resources, manpower and machines needed would ‘materialize’. Mr. Hira, a staunch follower of Baba by then (it is indeed amazing to hear about how Swami entered his life!) met up with a few other elders in the organisations and decided that they should spread awareness of this gargantuan humanitarian project. They also hoped to tap into the hearts of people and inspire them to contribute their bit towards the project. They went to Swami and prayed to Him to allow them to do that. Swami just smiled. Thus, Mr. Hira, Mr. Indulal Shah, Dr. Safaya and Justice P. N. Bhagwati headed to London where they would be meeting up with ‘philanthropists’. The meeting was scheduled in the Wimbledon Theatre in London. Mr. Hira was to deliver a talk. Though nervous, he did it with a prayer to Swami. The result was simply superb - he received a standing ovation. The talk on detachment, selflessness and service was very highly appreciated by one and all. However, as Mr. Hira discovered to his deep dismay, the appreciation had been restricted only to words and not deeds! The contributions towards the noble cause almost were nil! Very sad that he had let down his Lord, his Mother Sai, he discussed an astounding solution with his wife. He decided to sell his huge home in Tokyo and donate all the proceeds towards the noble project. He got the best real estate agents to estimate the value of his home. He was assured a sum of $20 million. Soon, he was on his way to Puttaparthi. No! Swami did not accept those $20 million. Instead he gave Mr. Hira a peep into what true detachment is. It is little wonder that Mr. Hira himself never goes gaga over his wealth and resources. He feels that he is just the Lord’s trustee and hopes to do his job well so that he can win the real treasure of God’s love and blessings. Has the detachment affected his business? Not one bit, he emphatically says. In fact, Swami’s entry into his life has made him grow in every sense. 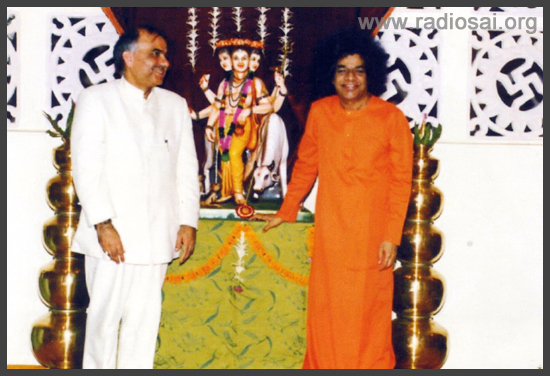 In that sense, Swami’s actual projects have been His mission to teach selflessness, detachment and love. And in order to achieve that, He has started hospitals, centres of learning and service projects. How else can you explain the ‘queer’ behaviour that He showed one day? Mr. Hira makes a mention of this incident too in the same interview on Radio Sai. "Boy! Should I read aloud what you have written to Me so that everyone may listen?" “Whatever You wish Swami,” was the answer. With a gleam of pride in His eyes and the excitement of limitless happiness in His heart, Swami read out the letter. You have given so much to me and to everyone here. You have provided free education for all my brothers and me and now I hear that you are constructing a big hospital that will provide the most modern healthcare facilities to every section of the society, totally free of cost. Bhagawan! I also want to be part of Your mission but I do not know how I can contribute because my parents are extremely poor. Out of their love, they send me pocket money. Bhagawan! For the last three months, I have not given my clothes to the dhobi (washerman). I washed my own clothes every night and have saved up some money. I offer these hundred-rupees to You. I feel so ashamed and small to give You so little. However, if this money can be used to even buy a small brick for the foundation of the new hospital, I will be the happiest child in the world. And the Lord who said that He had nothing to do with money, almost seemed to dance in joy possessing that 100 rupees! Mr. Hira observed this, sitting in the portico where Swami went about showing everyone that He had precious money! He said that the money given by the boy was worth millions for Him. “And that is because what the boy had offered was not money but selflessness and sacrifice. That is what Swami wants from us - detachment and sacrifice. 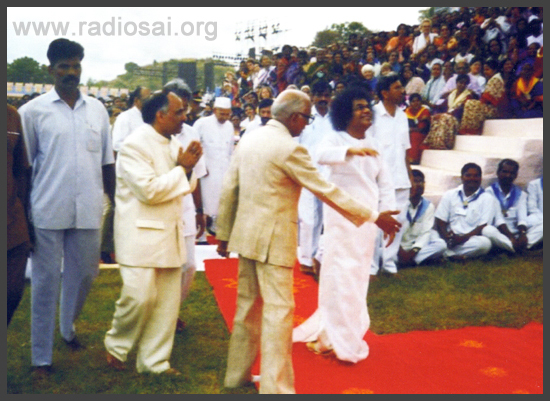 "If Bhagawan wills, there will be a rain of money, as He Himself had said in an interview. He does not depend on anyone’s contributions or donations. The purpose of His informing every one of the projects is to enlist people in the process of selflessness and detachment. And that detachment comes from ‘deep attachment’ to God,” concludes Mr. Hira before going on to narrate more awesome experiences and miracles. I too concluded the same. What else could anyone possibly conclude? I must add this post script that if anyone is in need of some inspiration and awe, and/or has not heard this interview yet, please free up an hour for the same. If the above links do not work for you, please download the mp3 file below. Mr.Ryuko Hira’s interview at Radio Sai. What are your impressions about this article? Please share your feedback by writing to [email protected]. Do not forget to mention your name and country.